The power behind Kids at Hope is its cultural strategy. Rather than advance KAH within a program or curriculum, KAH is unleashed by harnessing the power of WE. It is the WE rather than the ME that can reach all children and youth with a message and strategy that demonstrates how all kids are capable of success, No Exceptions!! It is the WE that represents culture. Show us how your school, organization, department, agency or community is encouraging everyone to see every kid as AT HOPE and how your team is using BELIEVE-CONNECT-TIME TRAVEL as part of your overall strategy. Keep in mind the ME can only reach some kids. It is the WE that can reach all kids! Like last year, in place of a traditional contest, we want you to share your celebrations with us on social media! 2017 Theme: Hope Hope Hooray! How do you best celebrate Kids at Hope in your school/classroom/program/ organization? Each year Kids at Hope selects a theme for it Kids at Hope Day/Week celebration. This year the theme is Celebrating “10’s”! We began this celebration on 10/10 and while Kids at Hope Day technically falls on 11/9/16 feel free to celebrate on 11/10 or even the whole week! Let’s Celebrate “10’s” for Kids at Hope Day! We know for a fact that children do better and are more successful when they have adults who strongly believe they will do well. We learned those adults present themselves as 10’s and that is powerful. Our conclusion was, kids need 10’s in their lives. Anything less than a 10 represents an individual who for some reason cannot accept the belief that all children are capable of success, NO Exceptions! The impact of adult’s beliefs about children, good or bad, are known as the self-fulfilling prophecy or Pygmalion effect and it has been studied for decades. Kids do not need 9’s; 8’s; 7’s; etc. They do not need adults who find reasons they cannot succeed. 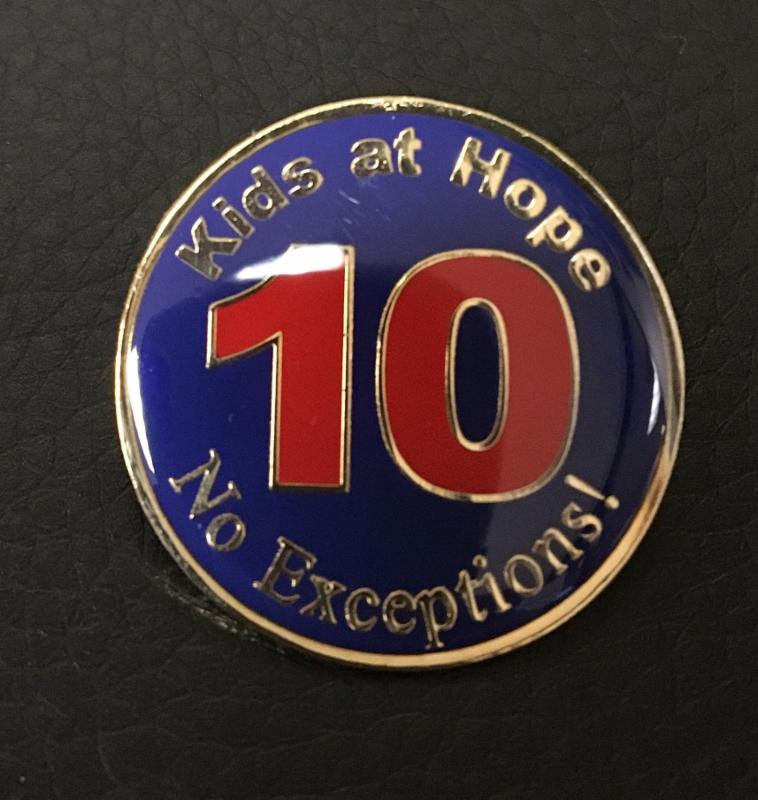 We want to recognize your creativity and commitment… Share your Kids at Hope Day activities with us – each entry submitted will receive a Kids at Hope “10” lapel pin. Win a $100 gift certificate to the Kids at Hope store and more! Feel free to use these downloads in your celebrations! Kids at Hope’s definition of future includes: home and family; education and career; community and service; and hobbies and recreation. By establishing four destinations rather than one or two the student’s mind is preparing itself for a multidimensional future. Kids at Hope calls that Mental Time Travel. Desert Star Elementary is this year’s Grand Prize winner for best overall demonstration of this year’s theme – Destined for Destinations! Desert Star is located in the Avondale Elementary School District, which is a Kids at Hope district! Desert Star celebrated the entire week featuring one destination each day. Each morning they highlighted one destination on the morning announcements and spent time in classrooms relating their everyday school lessons to the destination and setting goals for the future. Monday – Home & Family Day – students wore their favorite outfit from home or something that represented their family – students wore everything from comfy sweats to fancy cultural dresses. Teachers talked about their own home & family life with students and students time traveled to the future by writing or drawing how they envisioned their home and family life. Tuesday – Education & Career Day – students and staff wore college shirts or dressed as their future career choice. Staff decorated their doors with their college Alma Mater, exposing their students to all the possibilities available to them. Classes took tours of the campus to view all the colleges represented and students wrote and drew their goals for their future in education and career. Wednesday – Kids at Hope Spirit Day – Kids entered campus to a Tunnel of Hope. In one class students created a bucket list of 100 Things they want to do in their life and related the list to the four destinations. Another class Skyped with a future astronaut! Thursday – Hobbies & Recreation Day – students and staff dressed up representing their hobby (i.e. painter, sports, bakers, photographer). Friday – Community & Service Day – Students and staff wore school or club shirts to demonstrate how strong the school community was. They also held a canned food drive, where over 900 food items were donated to a local food bank. Students loaded the bags of food into the vans themselves. At the end of the week Desert Star students were able to more clearly articulate their futures, which will increase their chances of success in their home & family, education & career, hobbies & recreation and community & service. Herndon High School has been selected as this year’s Best Overall Award for their celebration of Kids at Hope Day! This is the first year a high school has won this award! The theme for this year’s contest was WE CONNECT – The Power of Aces. Herndon High School, located in Herndon, VA, is in its second year of implementing Kids at Hope. Their goal this year is to make sure every student has at least one meaningful and sustainable relationship with a caring adult in the building. They do this by documenting the existing support systems their students currently have, as well as identifying students for which those connections are needed. Students were also given “To My Ace” postcards to fill out for the Aces on campus in their lives. Students were asked to reflect on the Aces in their life, the adults who show them care, hold high expectations for them and/or give them opportunities to succeed. They wrote personal messages on the postcards to thank their Aces or simply share with them the importance of their role in the student’s life. Students then hand delivered the postcards to their Aces throughout the day. Other activities included students being given Hornet Pride cards for wearing blue & gold, which were turned in to be used for a drawing during lunch periods to win prizes. Students also had a chance to win prizes by answering Kids at Hope trivia questions. And throughout the school year, Herndon High School conducts quarterly Successful Parenting – Successful Children workshops for the Anchor Parents of the high school students. Please click link below for pictures from the day’s events as well as the greeting Principal William Bates sent to families at the beginning of this school year. Herndon High School is quickly becoming a MODEL Kids at Hope High School, demonstrating the school and community’s belief in all children, No Exceptions! Herndon Hornet Community, We are excited to begin the 2014-2015 school year and we can’t wait to see our Young Hornets on Tuesday, September 2nd. “All Hornets Are Capable of Success, No Exceptions!” Students at Herndon High School have embraced this mission statement. As a Kids At Hope school, we encourage our students to believe in their individual potential and challenge them to define success for themselves. They understand the importance of finding hope in the face of adversity. When presented with challenges, Hornets see the opportunity for change and growth. Last year, in the first implementation year of Kids At Hope, the HHS faculty and staff focused on creating a culture where WE BELIEVE in the success of all of our students, NO EXCEPTIONS! At the beginning of every Teacher Advisory period our students are encouraged to make a commitment to themselves to believe and have pride in their ability to make their dreams their realities by reciting the Kids At Hope pledge. Herndon High School faculty and staff recognize and are humbled by the uniquely wonderful opportunity we have to change the lives of children. For this reason, following the student pledge, we affirm our commitment to each child to discover the hidden gems that can ultimately shape their destinies. I am committed to search for all the talents, skills and intelligence that exist in all children and youth. I believe all Hornets are capable of success, No Exceptions! Although the words of the these pledges are printed on posters and in student’s planners and can be heard over the intercom each black day, the real strength of the Kids at Hope movement is in the way the adults interact with students and how students have come to interact with each other. As WE CONNECT, in implementation year two, whether through a simple smile as a student walks through the classroom door or by formally mentoring a student who needs guidance; it is our goal to ensure that every student at Herndon High School has at least one meaningful and sustainable relationship with a caring adult. All Hornets Are Capable of Success, No Exceptions! The goal of this day is to discover a MILLION treasures in children across the US and Canada! For the second year, Canyon Breeze Elementary won the Best Overall Award for their celebration of Kids at Hope Day! The chose the theme “The Treasure Within All of Us”. 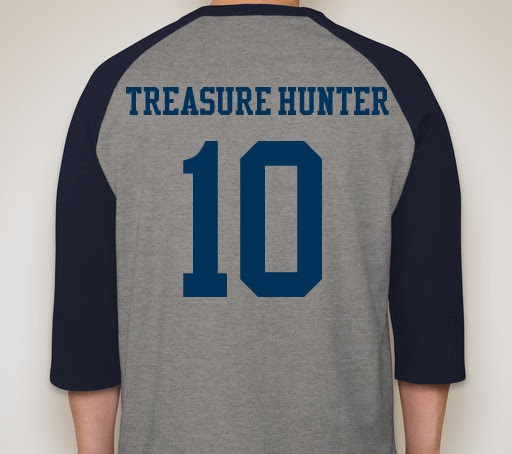 Each teacher dressed as a pirate and designated a specific jewel (i.e. Red Rubies) to each grade level who all wore the corresponding color. Each teacher shared their own treasure chests with their students with each child’s name on a jewel and a positive statement about that child. Many students wrote a “Treasure Within” essay. They created headbands where each student wrote something nice about them. There of course was a huge Tunnel of Hope lead by the SS Treasure Hunter and Principal Jeff “Jack Sparrow” Byrnes. Over 1,000 students, staff members and parents packed the gym for the Canyon Breeze KAH Day Assembly where they recited the pledges, sang the KAH/Canyon Breeze song and showcased the “hidden treasures” within their community with a talent show by many of the students. They then finished the day with students following a treasure map to each of the four destinations where teachers and community members shared their experiences in a particular destination. And finally they invited families to join their kids for an Anchor Parent barbeque lunch. Congratulations Canyon Breeze on Believing and Practicing Treasure Hunting and Time Traveling!